Vistas High School Principal Bob Anderson was raised by two educators who instilled in him a passion for education from an early age. He knew he wanted to follow in their footsteps, but that was only the beginning. 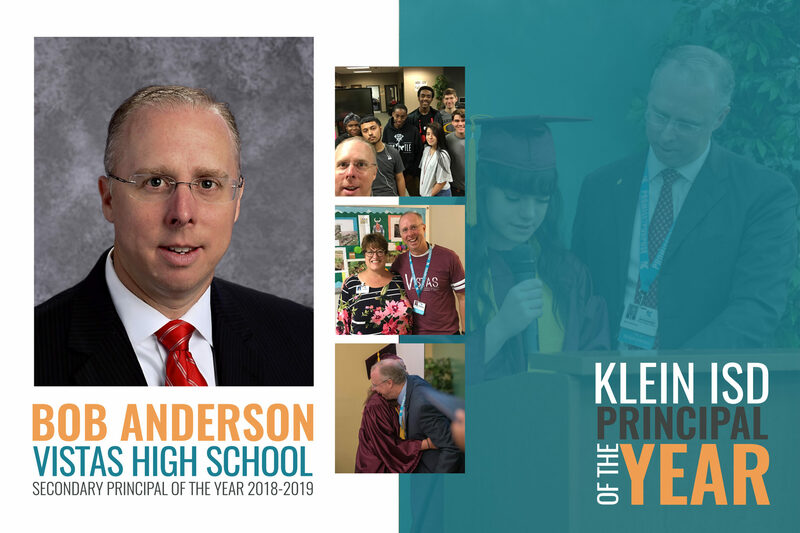 Last week, Anderson was recognized as Klein ISD’s 2019 Secondary Principal of the Year. This comes a decade after being selected the Elementary Principal of the Year, making him the first person in Klein history to be named both Elementary and Secondary Principal of the Year. After the announcement was made, teachers, faculty, and staff from across the district congratulated Anderson and noted his ongoing hard work. Catherine Chance, who worked with Anderson in 2010, during his first administrative position at Mittelstadt, says that the recognition is well-deserved. Anderson, who never wanted to be an administrator, has grown to love the role he is able to play in students’ lives. He is grateful for the opportunities that Klein ISD gives him to motivate, excite and challenge himself, as well as the learners he serves at Vistas High School today.